Hanuman is one of the most popular gods of Hinduism who played an important role in the incarnation of Lord Roma proved himself as his greatest devotee. He is also mentioned in the Mahabharata and some Puranas and Jain texts. He is variously described as an incarnation of Indra, Vayu and Shiva. People from all wakes of life worship him and admire him for his strength, humility and valor. As a devotee of Lord Rama, he became very popular for his devotion and great qualities. Like Ganesha he commands respect and veneration from children and elders alike. Any one who is familiar with the Ramayana, cannot but appreciate his divine nature and super human personality, shaped by the strength of celibacy, humility, selflessness, unsurpassed devotion, determination, fearlessness and an extraordinary commitment to work for the divine. Sita found in him a friend, a son and a loyal servant. Impressed by his loyalty and commitment to the cause of Rama, she blessed him to remain immortal in his existing form till the end of creation and help the loyal devotees of Rama. People believe that he is very much active on earth even today. Wherever the name of Rama is uttered or chanted, Anjaneya said to go there and become an invisible part of the scene. People pray to him for courage and confidence, freedom from sorrow and for protection against evil spirits and bad luck. Hanuman is a terror to evil forces. Because of his intense purity and devotion they are afraid to appear anywhere near him. Two interpretations are given for the word Hanuman. According to one, Hanu means disfigured and man means jaw. Hanuman burnt his mouth when he was young as he tried to swallow the sun. Since he has a swollen mouth, he is called Hanuman. According to another interpretation, Han means destroyed and man mean self-pride. Since Hanuman personifies humility and total absence of pride, he is aptly called Hanuman. 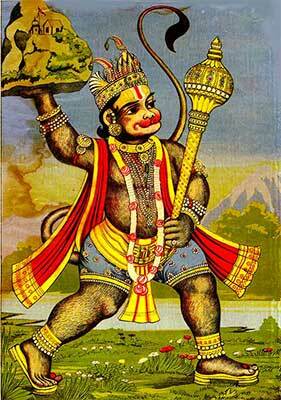 Hanuman has many other names. His most popular names include Anjaneya, Pavanasuta, Bhajarang Bali, Kapisa, Maruti, Manojavam, Mãrutatulyavegam, Jitendriyam, Buddhimatãmvarishtham, Vãtãtmajam, Vãnarayuthamukhyam,. 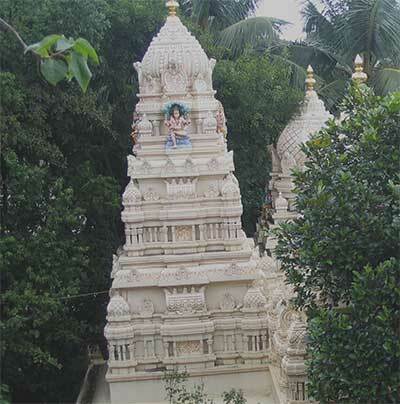 Shreerãmdutam, Atulit Bal Dhãmam, Hemshailãbh Deham, Danujvan Krushanum Gyãninãm Agraganyam, Sakal Gun Nidhãnam, Raghupati Priya Bhaktam, Sankat Mochan, Phalguna Sakha Laxmana Prandata, Dasagriv Darpaha etc. Each of them represent his qualities or his birth related information. He was born to Anjana. Hence he is Anjaneya. He is the son of Vayu or incarnation of Vayu. Hence he is known as Vayuputra or Pavanasuta. He has strong limbs and diamond like body. Hence he is Bhajarang Bali. Hanuman is known by many names. When he is cheerful he is called Prasannanjaneya. When he is in a ferocious mood he is called Veeranjaneya. When he is in a meditative mood he is called Dhayananjaney and when he is absorbed in devotion he is called Bhaktanjaneya. He is called Kesarinandana, though he was not actually the son of Kesari, because he was brought up by his step father. He is called Ramaduta, because he acted as the messenger of Rama to deliver a message to Sita. He is called Baladhama, because of his prowess, jnanagunasagara because of his pure qualities and bhajarangi because of his strength and devotion. There are several other names. Hanuman is worshipped in the temples and households both ritually according to the Smarta traditions and through pooja ceremony in the households. He is also worshipped spiritually through bhajans, meditation and chanting of his names. Millions observe fast on Tuesdays and refrain from drinking and smoking as a mark of respect for him. When people pray to Hanuman, they generally chant Hanuman chalisa seeking his help and protection. The significance of chalisa is explained in the next section. Hanuman Jayanti, a famous festival of Hanuman, is celebrated on different dates in different parts of India to honor his birth. In Maharashtra and Karnataka it is celebrated on the full moon day in the Hindu calendar month of Chaitra, in Tamilnadu and Kerala, during December and in Odisa during April. It is said that because of his complete humility he would not stir into action, unless one reminds him of his true greatness and his divine purpose. His devotees therefore chant the chalisa, to remind him of his greatness and prompt him to wake up from his devotion and help them. Hanuman Chalisa forms part of Sundarakanda in the Ramacharit Manas composed by Tulsidas (15th century AD). It is a prayer of forty three verses, with two invocatory couplets at the beginnig and one in the end. The main prayer consists of 40 verses. Chalis in Hindu means 40. Since it is a prayer of forty verses, it is called Chalisa. Each verse, has two lines, composed in a four metric form. Hence it is called Chaupai, meaning four legged. The verses extol the name and form, strength, qualities and greatness of Hanuman. Tulsidas states that whoever chants the Chalisa will have the grace of Hanuman. Hanuman chalisa is sung by millions of worshippers in households and temples. It is considered very auspicious. Following is the text of Hanuman Chalisa with English transliteration. Pavantnai sankar haran, Mangal murti roop. Ram Lakhan Sita sahit, Hrdaye basahu sur bhoop. Hanuman's chalisa has become a modern mantra, more popular, perhaps, than the Ramacharitamanas itself. Many of his devotees may not know Hindi. But they would chant chalisa with sincerity and faith. In appearance Hanuman looks like a well built monkey with the strength of a gorilla. His gait is very much human, despite of his monkey features, and he conducts himself admirably, without the clumsy movements of an ape. Physically he is half human and half monkey. He probably came from a race that had become extinct. Hanuman lives in the hearts of people through his exemplary devotion and surrender to God. Physically he is endowed with unlimited powers. Being the son of Vayu, the wind god, he has the ability to increase or decrease his size at will and also fly into the air and travel to far away regions of the earth and the solar system. In the imagery of Rama, we generally see Hanuman, standing reverentially on a side, sitting or standing in a humble manner with his hands joined in reverence. When he is shown alone, he appears in different ways, sitting cross legged, kneeling, standing or flying. In all cases we see him holding his weapon, the mace. When he is shown as flying in the air like a superman, he carries a mountain with one hand and the mace with the other. In some temples we see very tall and imposing images of Hanuman reminding us of his immense strength. The following are some of the images that are popularly associated with Hanuman. Hanuman is associated with both the epics, the Ramayana and the Mahabharata and several Puranas, and some Jain texts. He is considered a living deity who is still active in the earth consciousness. According the accounts in the Puranas, he was born to Anjana and Vayu. Vayu is a vedic divinity who is mentioned in several vedic hymns and worshipped along with Indra, Varuna and Agni. According to the accounts, Anjana was originally a celestial nymph. She was extremely beautiful and agile. Due to some unfortunate circumstances, she was cursed to become a monkey and live on earth. She married a monkey called Kasturi with whom she lived for some time. Then she came into contact with Vayu. Hanuman was born to her through Vayu. As a child Hanuman earned notoriety by his various acts of mischief which even it to be a fruit. He terrified the demon Rahu by shocking him out of his stupor. He fought with Indra and was badly hurt. His connection with Vayu saved him from further disaster. To cool down his temperament Vayu took him to Kailasa and left him to the care of Lord Siva. Siva blessed him and endowed him with divine bent of mind and enormous powers. Nandi, Siva's vehicle and his humble servant, taught Hanuman all the Vedas and the scriptural knowledge, besides imparting to him the qualities of humility and egolessness. We understand that because of these qualities Hanuman does not remember his true powers and would not stir to action unless someone reminds him, as it happened before he flew into the air to find Sita. Knowing his abilities and his dexterity, Sugriva made him his minister. When Rama reached Kishkindha in search of his estranged wife Sita, Hanuman saw Rama for the first time. That was a momentous occasion. It changed his life and the course of Ramayana forever. In that one moment Hanuman realized his true master and surrendered to him with his heart and soul. The thought of Rama never left his mind from then on. He played his dutiful role for the sake of dharma in the epic Mahabharata also. He taught a few lessons in humility to his step brother Bhima and also agreed to appear as an emblem on the flag of the Pandavas to boost their morale in their fight against evil. His temples are found all over in India, in towns and cities, on hills, in rural areas, forests and some in inaccessible places. Apart from several Hanuman temples, where he is the principal deity, his images are installed in several Hindu temples, especially those of Rama and Vishnu. In some parts of India, his images are also installed in open and in the outskirts of villages and worshipped. Hindus believe that wherever Hanuman images are installed those places will be free from demons and evil spirits. Therefore, for their protection also people install images of Hanuman in public and worship him. There are many temples built in his honor. The following is a list of temples mentioned in the Wikipedia. Shri Bhaktha Anjaneyar Temple in Vedasandur, Dindigul, Tamil Nadu.